Beginning today, Friday, March 4, through March 29, Cost Plus World Market is having what they are calling “Our Biggest White Wine Sale of the Year.” They are making this sale even bigger this weekend, Friday to Sunday, giving an additional 10% off when you buy four bottles and you can even mix and match. 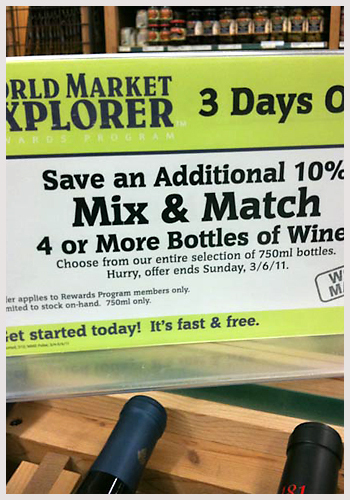 To get that extra 10% off, you have to be a member of the World Market Rewards Program but that is just as easy as giving the clerk an email address. Each Cost Plus store is stocked differently so you may not find the same wines that I found at the Hillsdale Cost Plus in San Mateo. Two outstanding deals are the Pine Ridge Chenin Blanc Viognier and the Dry Creek Fumé Blanc. The Pine Ridge Chenin Blanc Viognier has been written up many times, the latest being in Jon Bonne’s pick of his best wines under $20 in the S.F. Chronicle this past Sunday. I have not tried this vintage but past vintages have been excellent for the price. Sale price is $9.99. The Dry Creek Fumé Blanc (same thing as Sauvignon Blanc) is always an excellent value. The sale price is $9.99 and by buying four this weekend you get the price down to $9 a bottle, a great price. At Costco, the killer deal is the 2008 Pillar Box Red. The normal price at Costco for this Australian blend of Shiraz, Cabernet Sauvignon and Merlot is $7.99, which is amazing, but this week you get a $2.00 instant rebate at the checkout counter. Could they be making any money on this wine at $5.99 a bottle? Elsewhere this highly-rated wine is selling for $12. Parker 89 Points, Wine Spectator 85 Points. Lastly, as I mentioned above, in the Sunday San Francisco Chronicle and on S.F. Gate, Jon Bonne’s picks for wines under $20 was the feature in the wine section. Apparently a lot of folks were miffed that he did not mention where to buy these wines. In the Inside Scoop S.F. blog he gives us some advice on where to buy, but it is not much help. Bottom line, you have to do the legwork should you want to try any of these wines. The Andis Sauvignon Blanc is quite the wine! Best Sauvignon Blanc we have tasted in quite some time.